The bureau's employees have been held at the Prosecutor-General's Office for 11 hours. The National Anticorruption Bureau of Ukraine (NABU) has launched an investigation into the abduction of its employees by the Prosecutor-General's Office on 12 August, NABU chief Artem Sytnyk has said at a briefing. "Criminal proceedings were opened on a number of facts, including the abduction," he said. In his words, criminal proceedings were opened over the illegal use of physical and psychological pressure on the NABU employees. Sytnyk explained that two members of the NABU's technical staff were brought to the PGO department by force and held there for 11 hours. They were released only after Sytnyk contacted Prosecutor-General Yuriy Lutsenko directly. 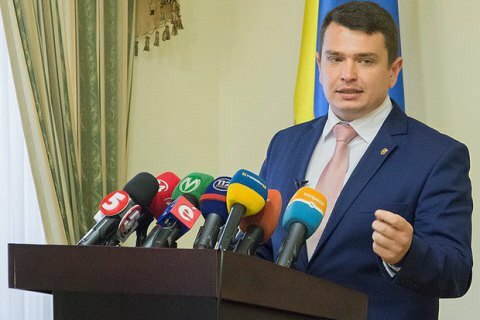 Nevertheless, Sytnyk insists that there is no confrontation between the PGO and the NABU. "Actions aimed at protecting the personal interests of the heads and employees of the PGO department for especially important cases in the economic sector are taking place," he said. On 12 August, the PGO said it discovered surveillance placed for investigator Dmytro Sus by means of an observation post. This investigator is believed to be close to propresidential MPs Ihor Kononenko and Oleksandr Hranovskyy. The bureau had to send its special team to secure the release of its employees, which evolved into a clash.